The rights to a Middle Earth amusement park have been acquired, but will we ever see it? Rumors of an amusement park modeled after Middle Earth date back many years, but a new trademark discovery could be the first glimpse we have at the rumor becoming reality. But before you get too excited, a brief look at the new owner of the trademark suggests we may never actually get to stroll through The Shire. According to a trademark registration obtained by fan site Tolkien Brasil, the rights to a Middle Earth theme park have been acquired by The Saul Zaentz Company. For those unfamiliar, Saul Zaentz is the man who owns the rights to film and marketing adaptations of The Hobbit and The Lord of the Rings, and produced an animated version of The Lord of the Rings in 1978. New Line Cinema contracted the rights to the franchise from him for the new, live action releases. 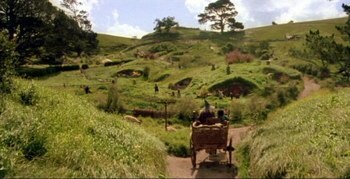 Zaentz was involved in legal action against New Line for revenue generated by the Lord of the Rings trilogy, and has sued other companies in the past for unlicensed use of the Hobbit brand. In fact, the Tolkien estate is currently involved in a lawsuit against Zaentz, claiming that he has overstepped the bounds of what was originally laid out in the original 1969 agreement, and that his current position as rights holder is actively tarnishing Tolkien's legacy. 2. Zaentz is looking out for his own best interests as he fights to lock down as much of the franchise as possible, in the hopes of some day leveraging the mark in court for monetary gain. Personally, I'm not holding my breath that I'll be visiting Middle Earth any time soon. How about you?